USDCHF started its bearish trend since the beginning of June and started its reversal pattern after crossing the 61.8 of Fibonacci retracement. The support lies at 0.96340 with resistance at 0.96520 which both lines are below the weekly pivot point at 0.98210. The EMA of 10 is located below the EMA of 75 showing the recent price decline. All indicators are signaling sell opportunity, the RSI is below the 50 level and the MACD indicator is in negative territory. The price is below the Ichimoku Cloud and the Chinkou Span, the Tenkan-sen and Kijun-sen are both showing horizontal trend. 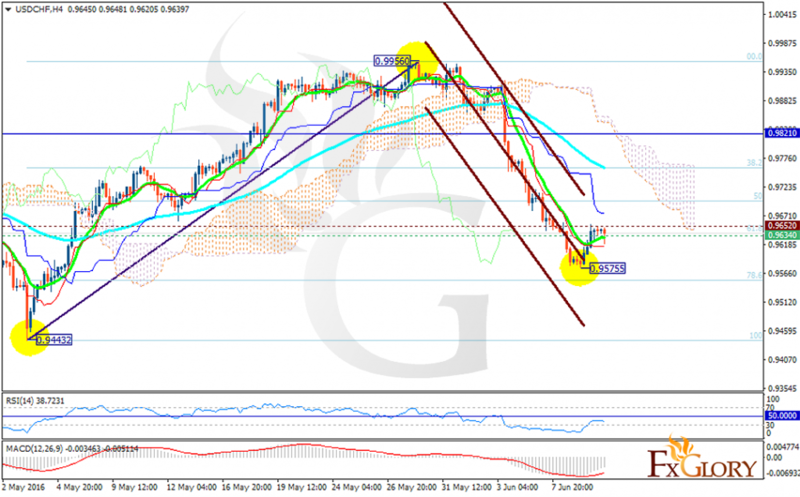 The support level breakthrough will pave the way for further decline targeting 0.9570 otherwise the pair will stay bullish and target 0.9690.